Material selection for any product is main part of a manufacturing industries. The quality of product is highly depends upon its material properties. These properties are used to distinguish materials from each other. A harder material is used to make tools. A ductile material is used to draw wires. So the knowledge of mechanical properties of material is desirable for any mechanical student or for any person belongs to mechanical industries. 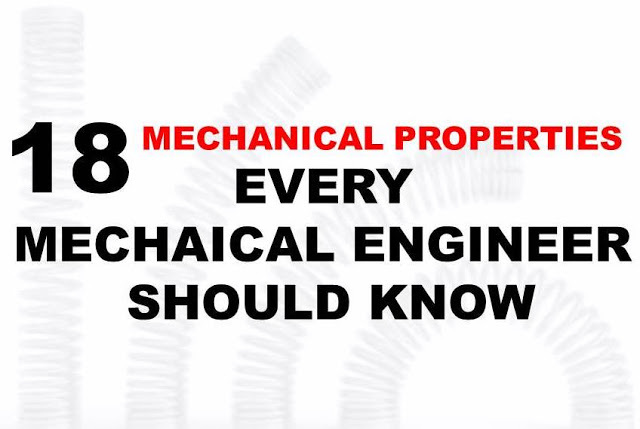 This article brings top 18 mechanical properties. I hope you will like it. There are mainly two types of materials. First one is metal and other one is non metals. Metals are classified into two types : Ferrous metals and Non-ferrous metals. Ferrous metals mainly consist iron with comparatively small addition of other materials. It includes iron and its alloy such as cast iron, steel, HSS etc. Ferrous metals are widely used in mechanical industries for its various advantages. Nonferrous metals contain little or no iron. It includes aluminum, magnesium, copper, zinc etc. The ability of material to withstand load without failure is known as strength. If a material can bear more load, it means it has more strength. Strength of any material mainly depends on type of loading and deformation before fracture. According to loading types, strength can be classified into three types. According to the deformation before fracture, strength can be classified into three types. If a material has same properties throughout its geometry, known as homogeneous material and the property is known as homogeneity. It is an ideal situation but practically no material is homogeneous. A material which has same elastic properties along its all loading direction known as isotropic material. A material which exhibits different elastic properties in different loading direction known as an-isotropic material. If a material regain its original dimension after removal of load, it is known as elastic material and the property by virtue of which it regains its original shape is known as elasticity. Every material possess some elasticity. It is measure as the ratio of stress to strain under elastic limit. The ability of material to undergo some degree of permanent deformation without failure after removal of load is known as plasticity. This property is used for shaping material by metal working. It is mainly depends on temperature and elastic strength of material. Ductility is a property by virtue of which metal can be drawn into wires. It can also define as a property which permits permanent deformation before fracture under tensile loading. The amount of permanent deformation (measure in percentage elongation) decides either the material is ductile or not. If the percentage elongation is greater than 5% in a gauge length 50 mm, the material is ductile and if it less than 5% it is not. Brittleness is a property by virtue of which, a material will fail under loading without significant change in dimension. Glass and cast iron are well known brittle materials. The ability of material to resist elastic deformation or deflection during loading, known as stiffness. A material which offers small change in dimension during loading is more stiffer. For example steel is stiffer than aluminum. The property of a material to resist penetration is known as hardness. It is an ability to resist scratching, abrasion or cutting. It is also define as an ability to resist fracture under point loading. Toughness is defined as an ability to withstand with plastic or elastic deformation without failure. It is defined as the amount of energy absorbed before actual fracture. A property by virtue of which a metal can flatten into thin sheets, known as malleability. It is also define as a property which permits plastic deformation under compression loading. A property by virtue of which a material can be cut easily. The ability of metal to dissipate the energy of vibration or cyclic stress is called damping. Cast iron has good damping property, that’s why most of machines body made by cast iron. The slow and progressive change in dimension of a material under influence of its safe working stress for long time is known as creep. Creep is mainly depend on time and temperature. The maximum amount of stress under which a material withstand during infinite time is known as creep strength. The amount of energy absorb under elastic limit during loading is called resilience. The maximum amount of the energy absorb under elastic limit is called proof resilience. The failure of a work piece under cyclic load or repeated load below its ultimate limit is known as fatigue. The maximum amount of cyclic load which a work piece can bear for infinite number of cycle is called fatigue strength. Fatigue strength is also depend on work piece shape, geometry, surface finish etc. The loss of ductility of a metal caused by physical or chemical changes, which make it brittle, is called embrittlement. This is all about mechanical properties of material. If you have any query regarding this article, ask by commenting. If you like this article, don’t forget to share it with your friends. Subscribe our website for more interesting articles.